Consumers in the United States bought some 472,000 motorycles in 2017, down from about one million in 2007. Most motorcycle fans reside in California, where over 842,000 motorcycles are registered. Other popular states for motorcycles include Florida, Ohio, Pennsylvania, and New York. Wisconsin–based Harley-Davidson is still the leading motorcycle manufacturer in the U.S. market, but H-D must be feeling its competitors breathing down its neck. Between January and December 2018, some 263,750 601+cc motorcycles were registered in the United States, while H-D's U.S. retail sales fell by about 10 percent to just under 132,900 in the 2018 fiscal year. 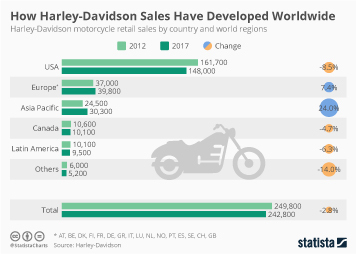 H-D’s key competitors include Minnesota-based Polaris* Industries, Audi's Italian subsidiary Ducati, Germany-headquartered BMW, as well as Asian companies like Honda and Yamaha. These two firms are also among the leading motorcycle manufacturers worldwide. In the 2018 fiscal year, Honda sold around 19.6 million motorcycles worldwide and about 313,000 to motorcycle shoppers in North America. * Polaris Industries is the owner of Indian Motorcycles and the Victory product line. More interesting topics from the industry "Motorcycles"